Apple to join suit in some areas. Since Apple insists on continuing to sell a 16GB iPhone in 2016 like its totally okay, mobile storage will continue to be an issue for millions of people for some time. SanDisk is trying to alleviate that problem with its iXpand Memory Case, an iPhone case with flash storage built in that connects via the Lightning port, which will allow you to dramatically increase your storage capacity without having to buy a new phone or carry around an extra dongle. Since Apple doesn't exactly make it easy to expand your storage with third-party devices, you'll need to install the companion app on your phone, which can automatically back up your camera roll and password-protect your photos and files. 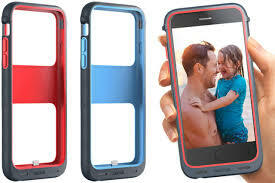 There's also an optional 1900mAh battery pack that can be attached to the case if you're willing to spend an extra $40. Sadly if you have an older iPhone or the bigger iPhone 6 Plus or 6S Plus, this case won't be of much help. The iXpand Memory Case is only compatible with the iPhone 6 and 6S and is available with 32GB, 64GB, and 128GB of extra storage for $59, $99, and $129, respectively. You can pick up the memory case in Red, Grey, Sky, and Mint on Amazon today.